If you want a trendy urban experience in the suburbs, bustling Bethesda is the hot spot you want. From the ethnic restaurants to the boutiquey shops to the farmer’s market to all the outdoor seating and picturesque fountains and parks, Bethesda is a mecca for young families, established professionals and singles who want a little nightlife in their backyard. 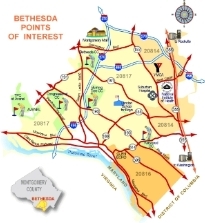 Bethesda is home to many large businesses, as well as NIH and the Naval Medical Center. The Metro runs through downtown Bethesda, making it an ideal location for those who work downtown but don’t want to live there. The Capital Crescent Trail, an off-road, paved path for recreational use, runs from Silver Spring through Bethesda and down to Georgetown. You can’t be bored in Bethesda. The calendar is full of art festivals, restaurant events, concerts and baseball games. This vibrant, cool city offers something for every age and interest. Bethesda boasts fantastic, kid and dog friendly neighborhoods and top-ranked schools. It’s been called one of America’s most educated small towns (Forbes), a top-earning American town (CNN money.com) and the top “Hottest Guy City” (Total Beauty). The Wyngate neighborhood reminds many residents of a Norman Rockwell painting. Thanks to the award-winning Wyngate Elementary School, laughing children walk and bike through the neighborhood, and lemonade stands are a daily summer sight. The houses range from 1950’s cape cods (many with significant upgrades and renovations) to the newer, larger homes with welcoming porches. Neighbors tend to know each other well and gather at Ayrlawn Park on sunny spring days. Runners, bikers and dog walkers take advantage of the miles of sidewalks, and residents love the close proximity to downtown Bethesda. Alta Vista/Maplewood is close to a great neighborhood park, the ever-popular YMCA , the Metro and NIH. Home to many World Bank employees, the neighborhood offers a dynamic international flair with enough different homes for every style. Maplewood Football, which has been a cornerstone of youth football in Bethesda for fifty years, plays its games at the park, and the cheers resonate through the beautiful fall foliage every year. This area is served by excellent schools and is an ideal location for those who commute to Bethesda, Virginia or DC. These picturesque streets are tucked into the heart of downtown Bethesda. Bordered by Wisconsin Avenue, Jones Bridge Road and East-West Highway, the homes here are in walking distance to two different Metro stations and hundreds of downtown Bethesda restaurants and shops. The Capital Crescent Trail, an off-road, paved trail loved by hikers, bikers, runners and dog walkers, winds through the neighborhood. Urban professionals love this little sanctuary in the middle of bustling Bethesda. This area is considered to be the fun, funky part of Bethesda! Kids and adults flock to Glen Echo Park, which is a national park that presents vibrant artistic, cultural and educational programs to residents. The famous Dentzel Carousel operates daily in the summer, puppet shows and excellent children’s theater are offered and many artistic classes for adults are regularly listed. This area is situated on the banks of the C&O Canal and boating is a regular pastime. Neighborhood children take advantage of the many parks and their parents take advantage of the terrific outdoor restaurants and unique shops. If you want an urban life in the suburbs, you’ll find perfection in the well-manicured, beautifully landscaped community of Edgemoor. Everyone who lives in this bustling neighborhood is in walking distance to downtown Bethesda and its numerous shops, restaurants and theaters. Many residents meet to enjoy the Edgemoor Club, a private swim/tennis/social club, which offers an appealing option to local swimming pool and tennis courts. If you’re headed away from Bethesda via foot, bike, car or train, you can hop on the lovely and convenient Capital Crescent Trail or the Metro with ease. This area has grown remarkably in the past ten years but looks like it’s been part of Bethesda forever with its mature trees and beautiful architecture. It’s considered a very desirable residential location by many in the area! The Landon Woods neighborhood in Bethesda offers excellent scholastic benefits: if you go the public-school route, your children will end up at the nationally recognized Whitman High School. If you go the private-school route, you probably drive by the breathtaking Landon campus daily. The homes in this neighborhood are stately and are nestled among mature trees and gently sloping hills, and residents are ideally located between downtown Bethesda and quick access to downtown DC. This neighborhood is perfectly situated on the leafy banks of the C&O Canal, and one can’t help but feel drawn back to a simpler era when walking through this quaint town. You can choose between adorable original cottages or larger homes that have been built on two lots. The little downtown boasts a post office, a market and a fantastic location next to Glen Echo Park, the Bethesda Co-op, the fire station, and a bike path that leads right into Georgetown. Greenwich Forest is a Bethesda development originally built in the 1930’s, and the architect used historic houses as his model. Many homes look as though they belong in the rolling English countryside, and while the design varies with each, all are reminiscent of a more genteel time. This close-in neighborhood exudes charm and the houses offer impeccable detailing in their construction.